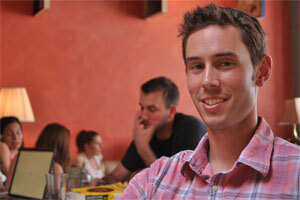 When it comes to education, John Petersen, MAT ESOL ’08, has done it all. After completing his undergraduate degree, he came to D.C. to teach at two bilingual public schools through Teach for America, in addition to earning his master’s in teaching at American. After graduation, he returned to teach a graduate level course on language assessment at AU. Now, Petersen spends his time working with a different side of the education system: administration. As a school operations specialist for D.C. Public Schools (DCPS), Petersen is responsible for providing operational support to schools so that teachers and administrators can focus their energy on student learning. Currently, his focus is on opening schools. This can include ensuring that the air conditioning works—an important asset to a classroom in the still-sweltering first weeks of school—to facilitating principals’ communication with the DCPS’ central office. Though the DCPS central office primarily deals with administrative issues, Petersen says that most of his colleagues are former teachers who harbor a passion for students and teaching. “There are a lot of people in the central office thinking of creative ways to make the school system the best in the country for our kids,” he says. Petersen shares that passion—he has been working for DCPS for a little over four years—and he says he misses the students that he taught humanities and English to for three years at Oyster-Adams Bilingual School and Powell Elementary as part of the Teach for America program. At both schools, Petersen taught English to many students who are native Spanish-speakers, making novels and poetry accessible to all students. Additionally, when he taught humanities, he was responsible for incorporating social studies standards and English standards in the same lesson. For example, while reading Hatchet, the novel about a boy whose plane crashes in the Canadian wilderness, Petersen had his students use computer software to map what the longitude and latitude was for where the plane fell. Even if Peterson had a long day, going from one teaching job to the other, he says it was worth it. Especially for certain moments, like when a struggling student stopped a class library reading session to make an announcement. The weekend before, Petersen had taken the boy, a “sensitive kid” with a tough guy exterior, to visit AU to let him see a college campus. Together they toured the campus, including dorms and the cafeteria.